If you are visiting the area and would like to do some of the rides here is the list: Saturday; Sunday; Monday; Tuesday; Thursday; Friday. Wednesday was a free day. 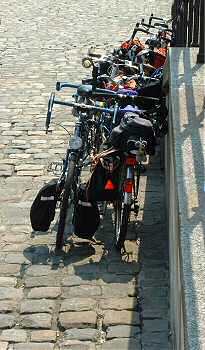 The International Tandem Rally 2003 was held at Moyaux in Normandy, France from the 24th to 31st May 2003. 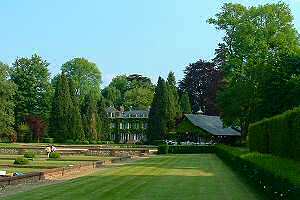 Moyaux is a small village situated about 60km east of Caen and 15km NE of Lisieux. It lies on the eastern edge of the French département Calvados. The weather as we drove to Moyaux on Saturday was pretty aweful and during the evening it rained in time for the reception planned to take place in Moyaux town square. The reception was therefore moved to a covered area at the nearby school. However, from then on the weather just got better and better and we had many sunny, hot days of cycling fun. We had the usual choice of routes of varying length each day, all heading off in generally the same direction and following short, medium and long loops with the option of a shorter Family Ride. People were free to choose their own start time and explore the country and villages at their own pace on their own or in groups of their own choosing. Wednesday was a 'free' day and there were a few suggested places to visit or people could just relax and enjoy the company of friends old and new. 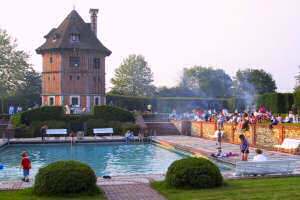 Each evening there was an activity such as Wine tasting, Games or a Barbecue, although some people preferred to sample the excellent local cuisine. The runs were arranged (mostly) to pass attractions when they were open! Short, Medium & Long Rides. Moyaux is situated on a plateau and the general terrain is flat. There are, however, very attractive small valleys, known locally as Bocage, which cut through the plateau in several places and a lot of the routes passed up and down these valleys. In general the climbs in and out of the valleys were not difficult or long.